In 1971, General Franco was awarded the gold medal commemorating the inauguration of the Palau Blaugrana. In 1974, the gold medal commemorating the platinum wedding of the club. 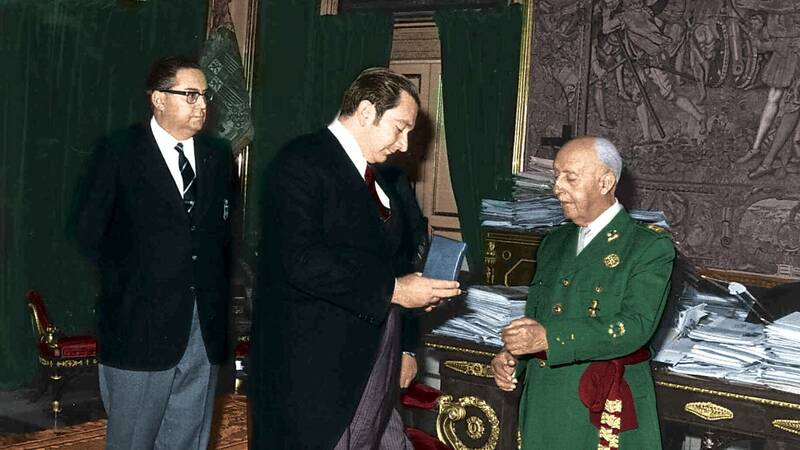 The Board of Directors of Barça "has agreed to annul all the distinctions granted to General Francisco Franco in the years 1971 and 1974 and all the effects related to the delivery. The agreement must be ratified by the partners in the next Assembly of Commendaires" . In the communiqué issued by Barça it is explained that "the Board of Directors has taken this decision in accordance with the commitment to review the case again, from a historical and documentary point of view assumed before the Assembly of delegates. We remind that In recent years, the withdrawal has been a periodical demand for many years through different channels of the club. " In 1971, the Board of Directors granted General Franco the gold medal commemorating the inauguration of the Palau Blaugrana and in 1974 awarded him the gold medal commemorating the platinum wedding of the club, required by the norm n or written that implied that the distinctions of new creation always had to be granted for the first time to Francisco Franco. In this case, Barcelona had awarded the first gold medal of the club, of new creation, to the Penya Blaugrana de Manresa as organizer of the first 'Trobada' of Barcelona clubs in Montserrat. At the request of the authorities of the time, The club created a new medal that was given to Franco a week after the acts of Manresa ". Josep Vives, spokesman for Barça, explained that in 2003 the withdrawal of these medals had already been considered but that, finally, decided not to make any decision because "there was no documentary evidence about that" . Vives explained that "there is no act of the Board of Directors that says that a medal has been awarded to General Franco." So the partners kept the petition, Barça put a documentary team to work. "The genesis and the reason why he was not on the Board of Directors were studied. It has been concluded that, de facto, these recognitions existed. A nobody escapes what was the historical context. The club had to invent a medal and give it to General Franco, "explained Vives.